I hope you are all enjoying these first few posts for my Holiday Gift Guide! I for one, am having a blast and am loving the fantastic selections that have been offered. Today, we are going to chat about coffee. Not just plain coffee, but flavored coffee. My personal favorite right now is Hazelnut Creme' Decaf Coffee. I am a huge flavored coffee fan. One of my gal friends introduced me to flavored coffee about 3 years ago and I have been hooked ever since. Because some of my friends are not flavored coffee fans, I do keep plain coffee on hand for when they visit but generally, I only fix flavored coffee for myself. The one thing I have a very difficult time getting past is the price of flavored coffee. Why is it that pampering yourself with a tasty cup of coffee has to be so very expensive? Well, today I have a great alternative to help save money and still enjoy a flavored cup of coffee! Inbru Coffee Flavors are made from Natural California Rice Hulls, the tough parchment surrounding and protecting each grain of rice as it grows and develops. When hulls are removed from rice during milling, the product is familiar pure brown rice. The hulls, however, are generally discarded. Rice hulls are an excellent natural flavor carrier. In fact, rice hulls are often used by home beer brewers as a filter medium because the material is absolutely taste-neutral, natural, and will not dissolve when exposed to high temperatures, moisture and pressure. Adding Inbru to the ground coffee in your brew basket is all it takes to flavor a cup or a pot of delicious coffee at home or work. The hot water and gentle agitation of the brew process release the Inbru flavors as the coffee is extracted. 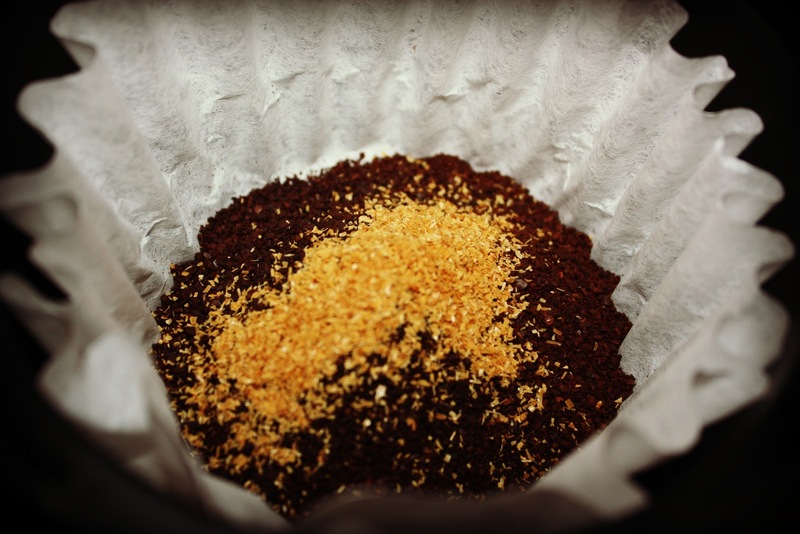 Inbru doesn't dissolve in the coffee – it remains in the filter with the coffee grounds. Inbru is brewed flavor. 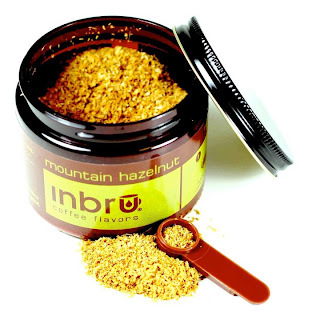 Like coffee grounds, Inbru Coffee Flavors are 100 percent compostable and biodegradable. The PET plastic container, scoop and lid are completely recyclable. 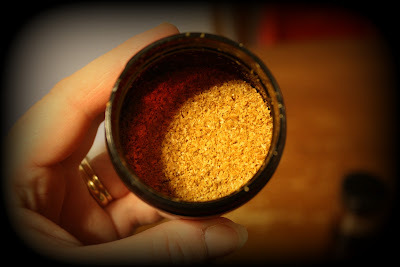 So, for this review I was sent three jars of Inbru Coffee Flavors to try and oh my. Was I in for a treat!! There are a total of 16 flavors to choose from and it was very difficult to pick out the ones I wanted to try. I chose to receive Creme Caramel, Danish Pastry and Chocolate Fudge. Like I said, I had never tried anything like this before but I knew it would probably be something that I would love! I was a bit surprised to see the yellow color of the flavoring...it was different for sure! The texture is light and fluffy and the containers really are not heavy at all. 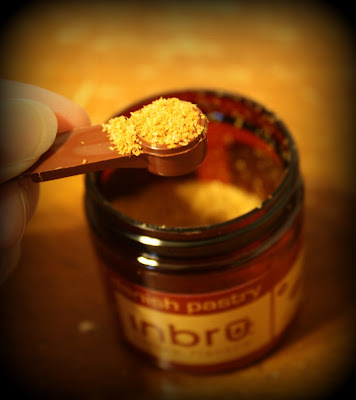 Each Inbru Coffee Flavor comes with a tiny scoop that you use to measure the flavoring. Each scoop flavors one 6 oz serving of coffee. I think I used two scoops. I learned after the fact that you should use about one scoop for each cup of coffee you are preparing. So, if you are making 12 cups, use 12 scoops. If you are making 6 cups, use 6 scoops. So, using Inbru is so easy. All you do is add however many scoops you desire to your un-brewed coffee grounds. It could not be any easier. I used two scoops of flavoring for 12 cups of coffee. I think I went on the low side because I wasn't sure how strong the flavor would be. While all the flavors I was sent were amazing, my favorite was the Danish Pastry. After making my pot of coffee, I think I could have added more flavoring. It was DELICIOUS!! I cannot believe how easy it was to turn my plain coffee into flavored! Because these containers are small, Inbru Coffee Flavors would make amazing stocking stuffers! I can think of so many people who would love to receive Inbru. Each Inbru Coffee Flavor retails for $6.95/24g. container. There are 16 flavors to choose from so you definitely have options. You can purchase directly from their website too! To connect with Inbru, check them out on Facebook and also on Twitter. 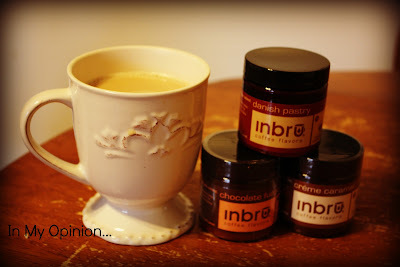 So, in my opinion...Inbru Coffee Flavors are wonderful!! 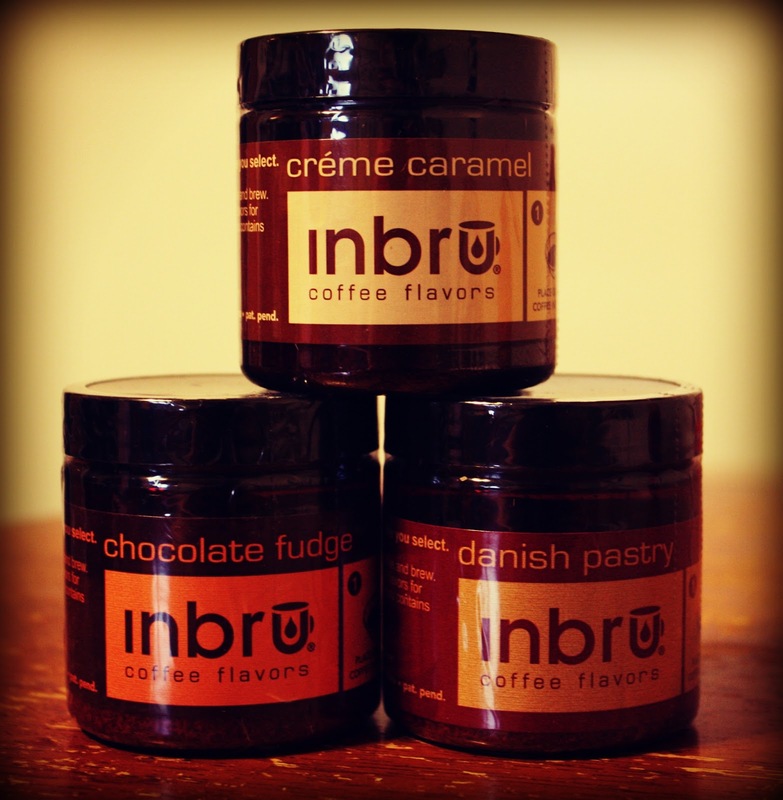 The perfect gift for anyone on your Christmas list, Inbru is my choice for delicious coffee flavoring. With so many flavors to choose from, even your pickiest gift recipient would be covered. I would definitely recommend this company to anyone...trust me, you won't regret the money you will save and the elegant flavor you will experience! Disclaimer: I received no monetary compensation for this post. I did receive free Inbru Coffee Flavors for review purposes. All quotes and stock photos are from the Inbru website and email. Prize is being provided and shipped by the sponsor. All thoughts and opinions are 100% mine. The Chocolate Fudge flavor sounds delicious! All the flavors sound wonderful. Peppermint stick and butterscotch sound amazing! Oooh, I'd love to try the Butterscotch Drop. I would love to try: Creme Caramel, Pumpkin Pie and Irish Creme flavors.